In short, it’s about the same as last year: publish two novels, write two new novels, and keep up the blog. I also have some stretch goals that I’ll discuss further down. Publishing: Just like last year, I hope to self-publish two books. They will be Ships of My Fathers, and Hell Bent. Both of these are in the edit queue, and I already have beta reader feedback on Ships of My Fathers. 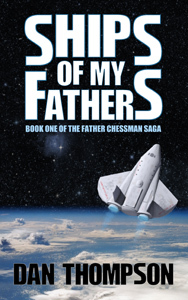 As a stretch goal, I’d also like to publish a third novel, probably Debts of My Fathers. Writing: Again like last year, I hope to draft two new novels. They will likely be the next two books in the two different series, and those are tentatively titled Oaths of My Fathers and Stone Killer. As a stretch goal, I’d like to draft a third novel, either another one in those series or possibly a mystery. I’ve also been playing around with a non-fiction book I’m writing with a partner. Blogging: I’m pretty much keeping the same format and schedule, but as I’ve said before, I’d like to add some short fiction. In addition to those main goals, here are a few more things I’m thinking about this year. Better multitasking: No, I’m not talking about writing while checking email or blogging while watching television. For creative work, I really do need to focus on one task at a time. So, what I really mean by multitasking is to switch from one project to another when one gets blocked. Last year I worked on publishing through early May, then edited one book in May, then wrote a new book from June through November, and December kind of disintegrated into illness and holiday distractions. Through the year, there were several weeks, even months, when I was either blocked or waiting for someone else, but I was focusing on one project at a time. This year, I want to move away from that and just keep things moving. I have enough irons in the fire that I’ll never be short of tasks. More marketing/promotion: And by more, I mean to say that there might actually be some this year. Last year I made an intentional choice not to do much of any promotion. 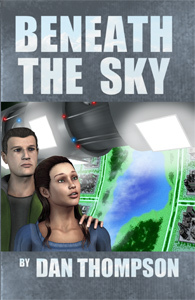 Sure there are some links to Beneath the Sky on my blog page, but after its launch, I’ve never done more than occasionally mention it in passing. I haven’t done any blog tours. I haven’t gone out and blasted on Twitter or Facebook. I don’t even have business cards with my writing info printed on them. I avoided all of that because I felt my efforts would be better spent in getting more books into print, and I still believe that. I figure that any marketing efforts will yield a better ROI when I have more than one thing to sell them. But if this year goes according to plan, I’ll have three or more books for sale, so it’s time for me to at least think about the marketing side. No, I’m not about to start spamming social media or running all over the blogosphere whoring my stuff out. Not even close. But I will, for example, get some business cards printed up, and I might sound the trumpets a little louder when I do my next novel release. Who knows, I might even look into a blog tour or posting more original content on some of the new Google+ communities. Friendship: This one is pretty foggy, but I wish I had a few friends who were writers. Certainly, I know several writers, but that’s more of a fan-to-writer relationship. I also know a couple of writers well enough to call them at least acquaintances, but they’re sufficiently further along that we’re not really contemporaries. They’re more likely to tell me I’m doing it wrong simply because I’m doing it differently than they did fifteen years ago. I suppose I’m looking to befriend other writers who are in my cohort, i.e. those who are about as far along in their writing careers as I am. Maybe they’ve already got a few books out, or maybe they are only now about to publish. I’m not looking for a formal writers group. I’m just looking for someone to commiserate with about that problem in chapter 12. Health: My health this past year has been crap. Some of this is kid-inflicted while the most of it is simply not taking good enough care of my body. This might sound more like a resolution, but I am tracking it elsewhere in a proper goal-like fashion. So that’s about it for 2013. Do you have any special goals?